I recently picked up an 85 Cannondale ST500 with a Suntour Superbe Tech rear derailleur. The cage is bent and the bearings in the guides don't feel too fresh. I'm just starting to get into bike maintenance - what's my best option for replacing this? I've noticed I can get something like a Suntour Cyclone for around $30 on ebay - would that work? You have friction shifters so you don't need to worry about shifter compatibility -- any derailleur can be shifted with a friction shifter provided the shifter pulls enough cable to get through the range of required shifts. So, all you need to worry about is the capacity and extreme cog sizes. I'd just buy some Shimano derailleur like a Shimano Acera one for 15-20 bucks. THAT won't work - you need to adapt the "no cable housing, direct pull" derailleur to one that works with housing. Cannondale made a part for that conversion. It has to be rivotted in, or you can make an adapter your self that allows housing to be used. 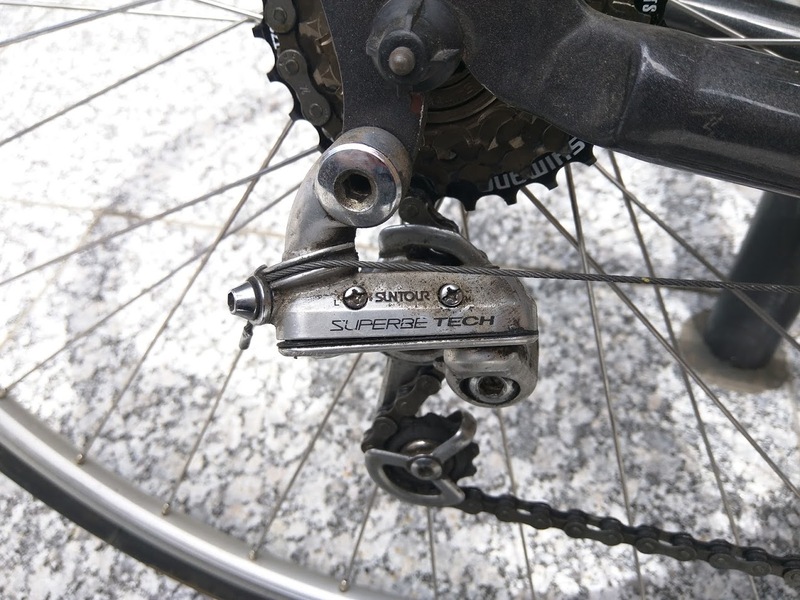 As 83cannondale alludes to, this was an unusual derailleur that, unlike most others, did not use a cable housing and the frame has no cable stop for it. So you'd need to get a clamp-on cable stop along with whatever conventional derailleur you used (and some derailleur cable housing). These clamp-on stops are available through the usual auction sites and bike shops that cater to older bikes. Not the answer you're looking for? Browse other questions tagged derailleur vintage cannondale or ask your own question. How do I find a compatible replacement for my rear derailleur? Rear derailleur adjustment needed? Should the rear derailleur pulleys hang perfectly straight down below cassette rings? How do I choose a replacement Derailleur?